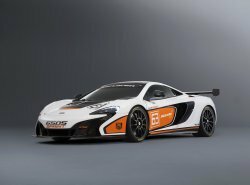 The new car is based on the 650S Coupe, but with multiple upgrades for track racing made by McLaren GT – the racing arm of McLaren Automotive. 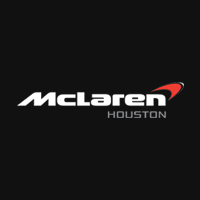 At the event in California, it will appear alongside other McLaren models, including the new track-only McLaren P1™ GTR. Most of the developments have been made beneath the aerodynamically optimised body, which has greater levels of downforce compared to the road car. The Brake Steer system and ProActive Chassis Control have both been refined, and combined with a race-prepared braking system to allow for later braking, improved feel and – with enhanced active aerodynamics – faster cornering speeds. It features a lowered ride height and recalibrated adaptive damping, improving on-track handling. The 19-inch centre-locking racing wheels are fitted with Pirelli slick or wet tyres, and for quick tyre changes, there’s an onboard air-jacking system. Crews will be able to cut down the car’s stationary time in the pits thanks to a larger motorsport fuel ‘bag’ tank with quick-fill connectors. 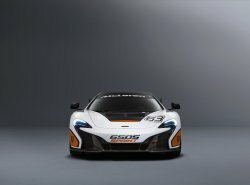 Inside, the 650S Sprint is a pure racer, featuring an FIA-approved rollcage, and a lightweight carbon fibre HANS-approved racing seat – a passenger seat is available as an option. An air conditioning system ensures the driver will be comfortable, even on the hottest desert race circuit. An integrated fire extinguisher system is also installed. Options include an aerodynamic package, including a carbon fibre rear wing and front splitter, developed using computational fluid dynamics (CFD). A lightweight polycarbonate windscreen can also be specified. The 650S Sprint is priced from £198,000, and is available from McLaren retailers across the world, or directly from McLaren GT.